We have not yet seen the birth registration of Abraham Good. He is counted in the census of 1861 at the age of 5 years. At this time the family is living in Portsea on Grigg St. The full entries for the census are listed in the page for his father Moses Good which includes his marriage to a second wife, Priscilla Long. Abraham is the surviving son that we know of for this union..
To date, our only childhood observation for Abraham is that of the 1861 census. We have been unable in the 1871 census to locate Moses Good and his wife Priscilla, although we know that Moses died in Croydon in November of 1871. However, we do find that there is a Mark A. Good in Portsea at the time of the 1871 census. The entry reads: chemists apprentice in Portsmouth in the household of a John Harrison. For reasons that become apparent later, we believe this entry applies to Abraham. The question arises as to why he would have changed his name. Some of his descendents in Australia that the Jewish connotations of the name Abraham were not taken well at the time and Abraham, who is now Mark, took it upon himself to change his name so as not to suffer any negative connotations of his Jewish name. "Thank you for your enquiry regarding Mark A Good. Unfortuanately we do not hold any documents relating to apprenticeships. I have checked our Registers of Pharmaceutical Chemists and Chemists & Druggists between 1877 (the earliest Mark Good could have registered aged 21) and 1900 but Mark Good doesn't appear. I am sorry to give such a disappointing reply and wish you all the best with your ongoing research. Assistant Keeper - Museum of the Royal Pharmaceutical Society"
from which it appears that he did not complete his apprenticeship. It is believed that Mark spent a few years in New Zealand before he went to Australia. We know that he was in England in 1871 and we see that he was married in Australia in 1899 with presumed children in Australia as early as 1895. We cannot find Mark (under any of his names) in the 1881 census of England and it is believed he spent the last 20 years or so of his life in Australia. This would allow us to guess that he might have been in New Zealand during the period of about 1875 to 1882, with perhaps a year or two on either end and a possibility that the stay was shorter. Sadly the records for New Zealand at that time are not extensive and not well organized for genealogy. There are no surviving census records in New Zealand at that time. However among records that do exist is the following: "Mr GOOD arriving in Bluff from Melbourne in 1879, age 20, a saloon passenger on board the 'Albion' - occupation gentleman. Country UK." Could this be our Mark? The age is close (about close as when he is married). Would he be a gentleman? Family lore has it that he was sent out to Australia because of his bad drinking behaviour in Portsmouth. If Moses spent the money to send him out he probably gave him a sum of money and told him to go (in fact Moses and/or Priscilla might even have been sending him money for some years up until the death of Priscilla in 1889). Moses was reputedly quite wealthy and it is possible that he provided sufficient sums initially for Mark to present himself as a gentleman. His great granddaughter Kim writes "I remember both Grandfather and Dad saying that he was 'paid to disappear to the other side of the world'". There are no further records for Abraham/Mark A until a marriage in Australia. 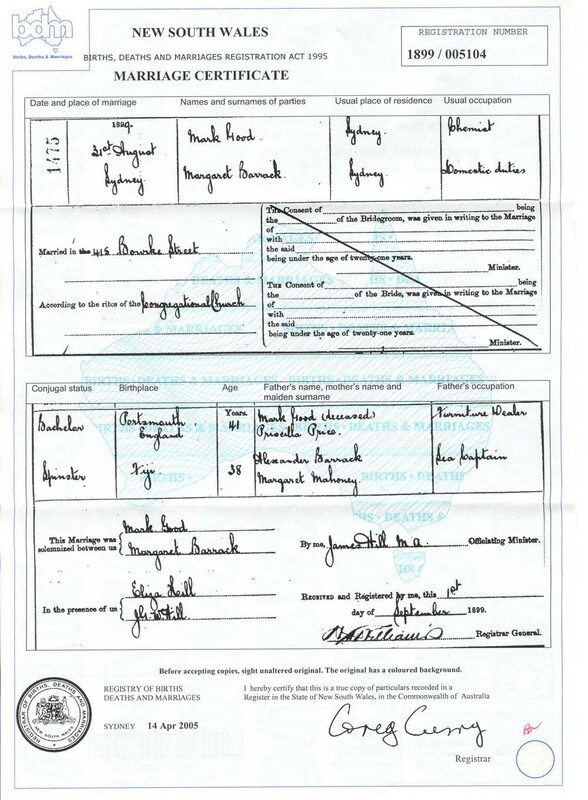 Mark has dropped the A of the middle initial and is registered as marrying Margaret Barrack on 31 August 1899. The marriage record shows his father as a Mark Good and his mother as a Priscilla Price. It is interesting that Mark would identify his father as Mark Good, a deceasxed furniture dealer in Portsmouth England; this would lead us to assume that he is not indeed the son of Moses; however his death registration indicates that his father is Moses Good (see below). Also, interestingly, his mother is identified as Priscilla Price, which is probably the surname of her first husband from whom she was widowed. On this certificate Mark also states he is a Chemist by trade, which ties in with the census record of 1871. Again the situation is confused a bit by his age which at 41 would have implied a We can assume that this is our Mark. At this point it is important to note that Margaret Barrack entered this marriage with children at foot. The NSW BDM has births registered in Margarets maiden name of Barrack of the first three children. In 1906 Mark lays claim to Alexander and Florence and the BDM now shows them registered as Goods. In 1907 he does the same for Mark A. This is interesting as Mark A. was presumeably named after his father and the child must then have been born prior to the marriage on 31 August 1899. By 1902 Mark has taken another pseudonym, George Mark, and this name is shown on the birth certificates of Ida E 1903 and Robert Gordon 1901. At this time he is still being identified as a chemist. It is interesting to note that the birth certificate for Robert Gordon states that there is no previous issue, which leads to the question as to whether the father was the biological father of the three adopted children. We are forced to speculate as to why George Mark/Mark A/Abraham was continually changing his name. Clues are proffered up when we investigate certificates further and note addresses. It becomes apparent that the family moved around a lot. Family lore has it that Mark was a drinking man. Perhaps this had some bearing on the name changes and continual moving around. It appears that Mark was perhaps running from debtors and there are family tales of 'flits'. The two known addresses for the family (20 Evans St, South Balmain and 8 River Road North Balmain which is now Birchgrove) were in a very, very working class area in those times, full of dirt and filth from the shipyards and coal mines. Mark's death certificate offers one final mystery. He died at an age that would now be considered young. In 1901 he still makes claims to being a chemist. On his death certificate of 1912 it is recorded that he was a Painter (ships) and that he died of cerebral softening. It would be interesting to find out when he changed careers and if it was the paint that addled his brain, or the alcohol, or perhaps a combination of both. On his death registration it is stated that his father was Moses Good of Portsmouth, a furniture dealer. We need copies of birth, and death certificates. We need details of the births of the children and their marriages. This document is 'in progress'. Any errors are mine. Contributions to this account of Abraham Good would be much appreciated.